To commemorate UN’s International Women’s Day and Beijing+20 Campaign: “Empowering Women, Empowering Humanity: Picture it!”, SACH – Struggle for change organized series of awareness raising events in Peshawar. An awareness raising event on the theme of “Equality for Women was organized by SACH in collaboration with Bureau of Population, Refugees and Migration at Abu Ali Seena Medical Institute, Peshawar on 8th March, 2015. 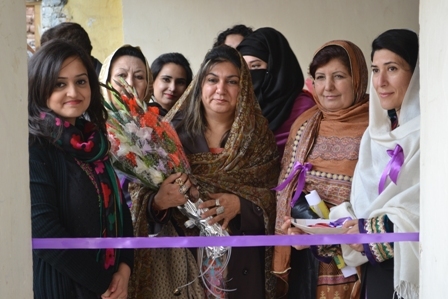 The distinguished Chief Guest Ms. Rabia Basri, President Women Wing PTI, Peshawar, inaugurated the event and highlighted the commitment of Government to the cause of women empowerment and their access to equal rights in the society. Ms. Mastoora Stanakzai, Director AMI while sharing her thoughts, appreciated SACH and PRM for the efforts to raise community’s awareness on the issue. A significant number of students participated in the event and performed on their national songs and did role-plays, recited the poems highlighting the issues related to women’s rights among refugee as well as the host community. Afterwards, a declamation contest was held among students of AMI. The subject was “Harmful Traditional Practices and Violation of Women’s Rights in Afghan Traditions”. The jury judged each participant and the students were conferred with prizes and appreciation certificates for their involvement and inputs for the event. Ms. Nida Nauman, Project Manager of SACH concluded the event and read the message from Khalida Salimi, Executive Director of SACH. In her message, she emphasized the importance of the day and said that it was the foremost duty of every individual to raise their voice for their rights and eradicate the evil of distinction and prejudice against women in every aspect. She further shared that the organization has been working for the vulnerable communities including refugees living in Pakistan and organization is fully devoted to the mission of fighting for Human Rights of the women. At the end of the event a ray of hope was seen amongst young girls about their important place in the society.